Yesterday’s day-in-the-life comic featured a #drawaTog challenge. That’s me in pigtails waving and my Ondu pinhole camera in the two middle panels. 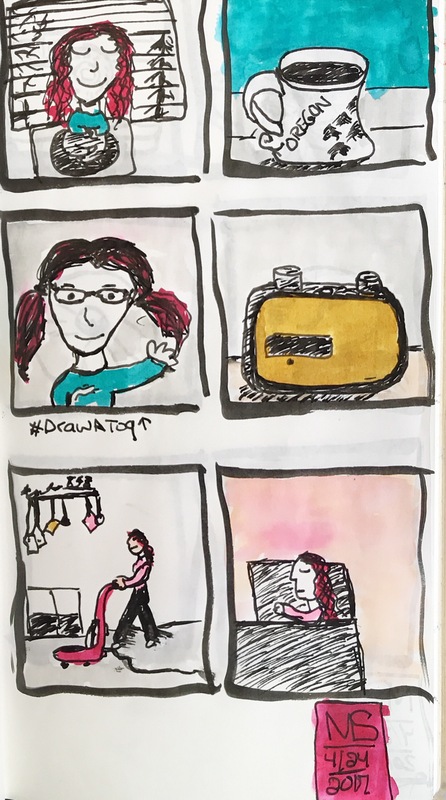 You can see what others have drawn at the #drawatog hashtag on Twitter. You can also follow @drawaTogparty for info on the challenge. Incidentally, for this the pen that I used was a Uniball Vision Fine. I remembered why I stopped using this pen. I love how you can get detailed but it streaks like a mo fo. Frustrating. Today I went back to my Pentel Pocket Brush Pen because I just can’t seem to quit that pen. I love it.